The Decade of Dance Education (2015-2025) is a ten-year campaign designed to raise the profile of dance education centered in the arts, while simultaneously ensuring the growth and development of NDEO for years to come. The mission of this campaign is to raise the awareness and funds needed to build and sustain NDEO in our next era of growth, so that we can best support and advance the field. Launched the Professional Development Scholarship Program, allowing NDEO to give back to the dance education community. Scholarship recipients are offered a one-year complimentary NDEO membership and registration to NDEO Conference or OPDI Courses. Introduced our newest journal, Dance Education in Practice, to provide our members with the latest practical dance education research: ideas for curriculum development, lesson planning, assessment, studio management, and more. Revamped the NDEO Website (www.ndeo.org), to raise the profile of our organization and provide easier navigation and access to our programs and services. Hosted the first of two Special Topic Conferences on the NCAS Standards in Dance. These conferences serve as both an opportunity for professional development and a think-tank for advancing the field. Revamped the Board of Directors, to provide more opportunities for NDEO members to take a leadership role in the organization. Developed and ran our first webinar series, to provide professional development on the NCAS Standards in Dance. Developed and field tested the Dance Entry Level Teachers’ Assessment (DELTA), a pre-service exam for dance education students who want to teach in the K-12 setting. Launched six (6) new OPDI online courses: 111ab: Dance History - Global, Cultural, and Historical Considerations; 112: Implementing the New National Core Arts Standards; 114: Teaching Dance to Students with Disabilities; M6: Intro to Creative Dance for Early Childhood; M7: Ballet Theory and Composition; M8: Designing Model Cornerstone Assessments for the New Dance Standards. Launched a new website and induction system for the National Honor Society for Dance Arts, raising the profile of NHSDA nationally and providing more efficient customer service. Held our first Membership Drive, to grow our membership base and reward current members who refer friends and colleagues to join NDEO while raising awareness of the benefits of membership. Increased our social media presence for NDEO on Facebook and Twitter, and for NHSDA on Facebook, Twitter and Instagram. Developed a new Applied Strategic Plan for NDEO designating Priorities for Dance Education, which is based on three main tenets - Connect the Field, Build K nowledge, and Cultivate Leadership. Hosted two Special Topic Conferences: National K12 Dance Education: Standards in Action, and Jazz Dance: Roots and Branches in Practice. These conferences serve as both an opportunity for professional development and a think-tank for advancing the field. Launched two (2) new OPDI online courses: M9: Choreographic Sharing and Explorations and M10: Movement Behavior Analysis and Profiling in Dance. Posted an open call for Board Committee Members, who assist the NDEO Board of Directors with relevant projects and tasks, and contribute to the overall working of the Board. Opening the application process to the general membership provided more opportunities for our members to develop leadership skills, build their resumes, and get involved in the organization. Developed a Mentorship Program, and launched a pilot version for K-12 teachers. This program grew from member interest as posted on our online forums, and is coordinated by a member committee with NDEO support and oversight. Hosted the first-ever Men in Dance Symposium, a Special Topics Conference on issues related to men and boys in dance. This symposium developed from member interest in the topic and was initiated and organized by a member committee with NDEO support and oversight. Began an initiative to have the Dance Entry Level Teachers’ Assessment (DELTA) recognized as the official pre-service teacher’s exam in several states. Launched the Guest Blogger Program, an opportunity to NDEO members to have their articles published on our Behind the Curtain blog. Adopted the National Registry of Dance Educators as an official program of NDEO and launched the Registered Dance Educator Accreditation (RDE), to help us better serve dance educators working in the private sector by offering a unique accreditation process designed around their needs. Launched two (2) new OPDI online courses: M12: Jazz Dance Theory and Practice; M13: Modern Dance Theory and Composition. Established the NHSDA Preferred Vendor Program, to connect our NHSDA Chapters and Inductees with special offers from outstanding dance-related companies and programs. Launched five (5) new OPDI online courses: 115: Dance Integration: Re-envisioning the Creative Process; 116: Harkness Center for Dance Injuries: The Applied Science of Dancer Health and Injury Prevention; 117: Developing Strategic Leadership in Dance and Life; M14: Music Fundamentals for the Dance Teacher; M15: Focus on Dance Education - NDEO National Conference. Released the NDEO College Dance Directory, to help our NHSDA inductees and K-12 dance educators with students interested in a dance major search for colleges. Conducted a pilot launch of the DELTA in preparation for the exam’s national launch. Began a new fundraising initiative, The Annual Appeal, to support our Professional Development Scholarship Fund. Added a full-time staff position with a focus on Member Services to help better meet the needs of our membership. The theme of the Decade of Dance Education is “It All Starts with a Dance Teacher!”. Through this theme, NDEO recognize you, the dance educator, for the enormous impact you have on your students’ lives. 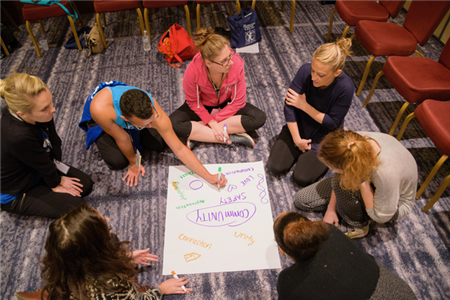 Professional dancers and former dance students credit their dance teachers for imparting 21st century skills, habits of mind, and college and career skills through their dance education. As a dance educator, you have a real and lasting impact on their students, and NDEO is committed to supporting you through the Decade of Dance Education and beyond. We hope that you will join us in our effort to raise the profile of NDEO and the field of dance education centered in the arts by participating in the Decade of Dance Education. With your help, we will advance dance education centered in the arts! Photos from NDEO National Conference 2016 by Rob Cannon.